My paternal nonna (grandmother) was the quintessential Italian cook. She was short, a bit on the round side and everything she cooked in her kitchen was Italian, even after living in a Latin American country for over 30 years. I always thought she missed Italy so much, that was the only way she could stay connected to the mother country - By refusing to change her cooking style and adapting new ways. She stayed true to her Italian ways. And that is how I learned to cook Italian food. The old way. I do miss cooking in that kitchen. My love of cooking comes from these lessons. She was knows for tons of signature dishes. And their ranking order was establish by how many people in the family would request them and how often. This eggplant dip was one of my favorites. Even at that young age, with all the grown up ingredients, I loved this dip. It’s perfect to eat with toasted bread, or smoother on French bread or on top a steak, or mix into scramble eggs. As you can see the application is endless. It’s not a complicated recipe, and as always in Italian regional cooking, simplicity rules the day. Plus it keeps well in the refrigerator, which gives me an excuse to make a big batch and eat it for days. The only tip I can give you on this is the type of eggplant to use. You can use any type of eggplant. But, I like the Chinese or Indian variety. Mainly because they are both sweeter and tender than the American eggplant, helping the dish hit its sweet & sour point to its full potential. 2 Eggplants (if using the big American variety) if using the Indian or Chinese, you will need about 5 or six. 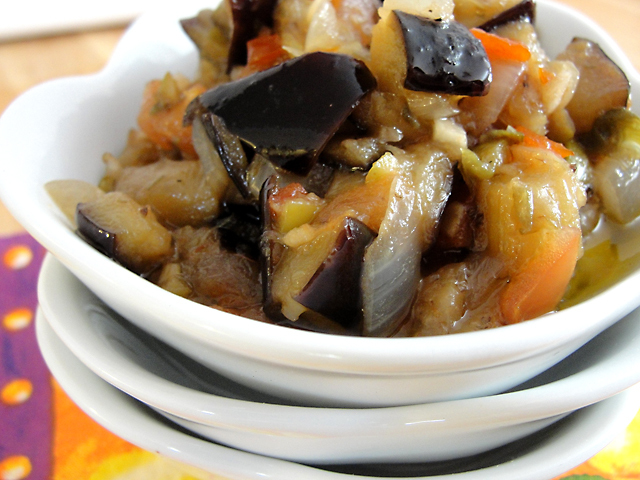 Cut eggplant into small cubes (about ½ inch) and transfer to a colander. Toss with 2 teaspoons of salt. Let drain 1 hour. While waiting for the Eggplant, prep your other ingredients by chopping your onions, tomatoes, garlic, capers, olives and measuring your vinegar and sugar. Put everything aside. After an hour, gently squeeze (I use a potato ricer to do this task) eggplant to remove excess moisture and pat dry (they need to be very dry). Heat about 1 ½ cup of the oil in a heavy skillet over moderately high heat until very hot. 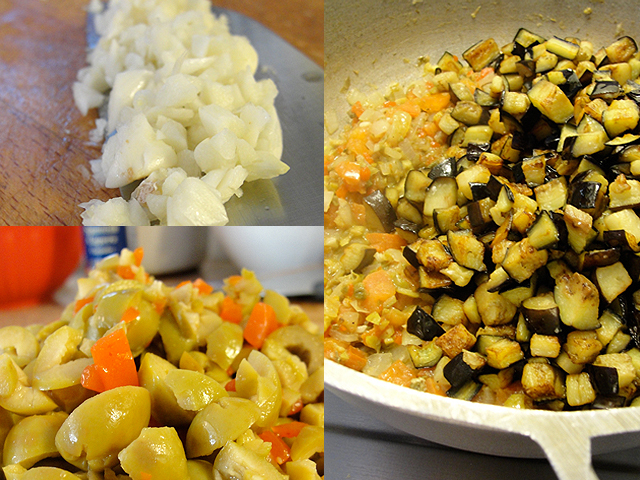 You can test the oil by adding one of the eggplant cubes, if it rapidly bubbles up, the oil is ready. Fry the eggplant in batches (don’t crowd the pan, you want the eggplant to crisp up) stirring and turning constantly with a slotted spoon, until browned and tender, 3 to 5 minutes per batch. Transfer to a tray lined with paper towels to drain and cool. Pour off all but 2 tablespoons oil from skillet, then reduce heat to moderate and cook onion, until translucent. Add the garlic and cook until golden, season with salt and pepper, stirring occasionally, about 5 minutes of so. Add the eggplants and tomatoes and stir to coat. Then add the olives, cappers and cook for about 2-3 minutes more to mesh all the flavors together. Now the tricky part, building the sweet and sour flavor. I usually start by adding the vinegar and sugar in increments of 1 tablespoon at a time, stirring and cooking for about 1-2 minutes after each addition and tasting it as you go along until you get the right amount balance to your taste. I’m also at the same time, adjusting the salt and pepper if needed. Remember taste, taste and taste some more, as you are cooking along. Once you find that right sweet and sour punch, simmer uncovered, stirring occasionally for about 15 more minutes. Cool to room temperature and served. You can also store it in a jar and chill in the refrigerator. It usually keeps up to a week. In my house, we finish this up by the third day, we cannot seem to keep it around for much. 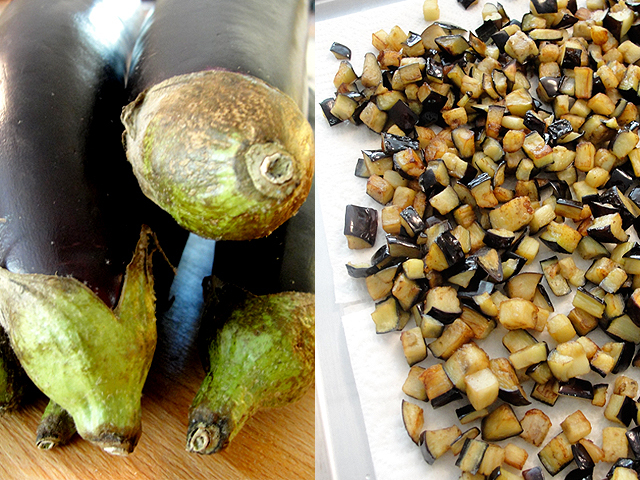 Go easy on the seasoning of the salt, since you salted the eggplants during the soaking period. And the Olives and cappers are already on the salty side… so make sure you taste each step of the way. You can replace the red-wine vinegar with Balsamic, but you need to reduce the sugar as well. You can also add herbs to it, like oregano, or thyme. Be sure to do this as the last step.